The Economic and Financial Crimes Commission( EFCC) has traced 61 assets to former Managing Director/Chief Executive Officer of Oceanic Bank, Mrs. Cecilia Ibru, in Dubai in its ongoing tracking of looted funds. The assets are 41 shops, 16 mansions and 4 park towers. All the properties have been confiscated, but their sale is trailed by controversy because about $4,522,413.20 remain unaccounted for in the last seven years. Out of the over $7million purportedly realised from the disposal of the properties, the Assets Management Corporation of Nigeria (AMCON) only received $3,278,238.69 from the proceeds. The controversy over the sales led to the EFCC’s interrogation of four AMCON officials and former head of the transactions, who is now with a bank. More bankers have been invited for questioning over how the proceeds were wired from Dubai into some individual and companies’ accounts in Nigeria. But the EFCC may watch-list a United Kingdom (UK) based lawyer, who was engaged in June 2011 by AMCON to dispose the assets. According to a fact-sheet obtained by The Nation, the details of the assets seized from Mrs. Ibru emerged after a crack team of EFCC detectives visited Dubai in the United Arab Emirates (UAE) to uncover alleged looted funds and assets bought with crime proceeds. Apart from identifying the properties of many politically exposed persons (PEPs), the list of Mrs. Ibru’s assets and their alleged questionable disposal were highlights of the EFCC team’s focus. 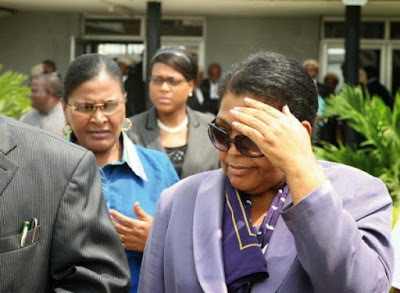 Justice Daniel Abutu of the Federal High Court in Lagos on October 9, 2010 sentenced Mrs. Ibru to 18 months imprisonment. He ordered her to forfeit N191billion worth of assets to the Federal Government through AMCON. The assets to forfeit include properties in Nigeria, United States of America, and Dubai. She was also ordered to forfeit shares in over 100 firms both listed and unlisted on the Nigerian Stock Exchange. The fact sheet gave details of the assets traced to Mrs. Ibru, who spent six months in prison. The fact-sheet said in part: “About 61 assets were traced to Mrs. Ibru in Dubai ( UAE). And from the information from AMCON, 41 of the assets were shops, 16 were other types of houses/mansions and four park towers. Some of the towers (A2005, A2008,A 2203) have been linked with two persons. “While one of the park towers was paid for, three others had not been fully paid for but they have been de registered. Due to non-payment of full purchase price, a Dubai firm, DAMAC, has refused to refund the deposits. “A registered Nigerian company with one banker as alter ego, was engaged by AMCON in June 2011 to provide legal services for the sale of the assets. “A UK-based lawyer was given the power of attorney which was notarised in Dubai. “Findings indicated that the attorney engaged allegedly received over $7million but about $4,522,413.20 remained unaccounted for. The anti-graft agency said: “Investigation showed that some of the proceeds of the sales were wired from Dubai into the accounts of some individuals and companies. “The EFCC team has interacted with four officials of AMCON including a former staff, the ex-Head of the transactions, who is now with a bank. The EFCC said it had been trying to prevail on Williams to account for the sale of the 61 properties. The fact-sheet indicated that “the banker was contacted via his Nigerian mobile line but he refused to honour the invitation. An invitation letter was served on his office but he has not responded."